Do you have ants all over your house? Having ants crashing at your place can definitely ruin your day. Get rid of ants the natural way and keep these uninvited guests away from your house. Know what attracts ants to your property. Your unsealed honey bottle or the breadcrumbs your toddler left in the garage might be the root of the problem. Keep food tightly sealed in storage or in plastic baggies. Ants that have no food typically move to a different place with a readily available food supply. 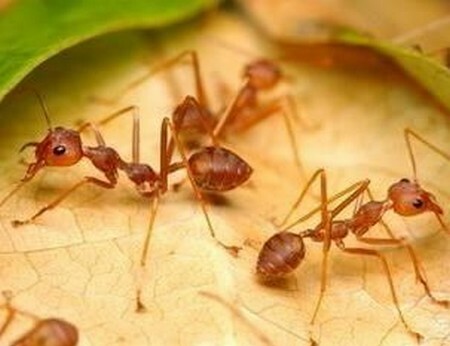 If you leave no trace of spills or food particles, ants cannot locate you. Clean your dining area immediately after meals. You may want to use a vinegar solution to spray and clean the table and counter tops. Throw away trash properly, and keep the recycle bin and trash cans as far from your house as possible. Always keep your sink clean. Have no dirty dishes lying around and no food stuck in the drain. Keep your perishable foods inside the refrigerator. Fruits attract ants, so keep these refrigerated as much as possible. Make sure to have no standing water in or near your home; after all, ants drink water, too! Add laurel or bay leaves to specific food storage areas. Sugar, paprika and kitchen flour in particular attract ants, so add a piece of laurel or bay leaf inside those container to keep ants away from these items. Use chalk to keep ants away from specific areas. Ants tend to move away from any chalk lines. This will help deter them from moving inside the kitchen area. You may also use cinnamon, as covering their trail with cinnamon will deter the ants from that path. This method can work in a relatively short period of time since ants make new trails of their own when you impede their progress with chalk. Seal any cracks you see using caulk. Barricade your home from these uninvited guests. Salt will work as well. You may want to spread it under doors, near windows and walls. Make sure you plan this carefully, however. Use cornmeal to kill ants, a safe alternative for homes with pets and children. When ants consume cornmeal with water, they can’t digest it properly and it will swell inside their digestive tract. Place cornmeal in areas where you see ants frequently. Mix boric acid with maple syrup or honey. The simple mixture serves as common bait and has similar properties to popular commercial ant poisons. Boric acid will dissolve the insects’ skeletal systems. Use cautiously. Use cream of wheat (farina) as bait. When the ants eat it, it will expand and kill them.